Centers That Counsel Women Against Abortion Help Them Enroll In Medicaid : Shots - Health News Medicaid pays for nearly half the births in the U.S., and centers that counsel women against abortion often help pregnant women enroll in Medicaid so they don't have to worry about health care costs. 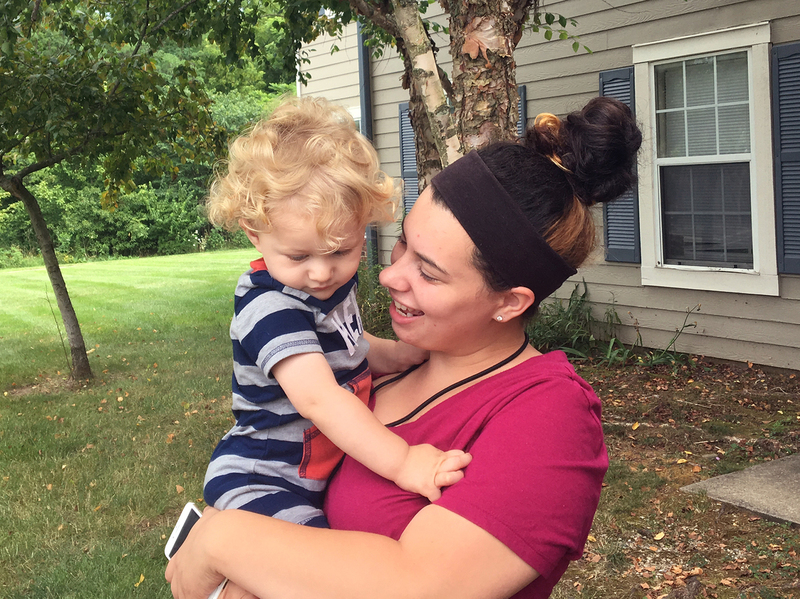 A pregnancy resource center helped Taylor Merendo apply for Medicaid in Bloomington, Ind. Now 21, she is caring for her 19-month-old son and training to become a nursing assistant. When Taylor Merendo moved to Bloomington, Ind., nearly two years ago, fleeing an abusive marriage, she needed help. "I was six months pregnant and at that point in time, I really didn't have a stable place to live," Merendo says. That's where the Hannah Center in Bloomington stepped in. It's what's known as a crisis pregnancy center, where women are counseled against abortion and often get support after their babies are born. Executive Director Tina Tuley-Lampke says many low-income women come in believing they need to have an abortion, and she tries to persuade them otherwise. "Because for many women it's not truly a choice when they feel like they don't have any other options," she says. Women's health has been the center of a lot of controversy in the ongoing health care debate, and much has focused on federal funding for Planned Parenthood. While federal funding for abortion is already illegal in most cases, many abortion-rights opponents also want to permanently block Planned Parenthood from receiving federal reimbursement for providing services like contraception. As it turns out, many crisis pregnancy centers like the Hannah Center, which are also known as pregnancy resource centers, also rely on Medicaid as a tool for helping low-income pregnant women. The non-profit organization housed Merendo for about a year in its maternity home, and helped her apply for Medicaid in Indiana. Low-income pregnant women qualify in every state, though exact income requirements vary from state to state. Now 21, Merendo is caring for her 19-month-old son and training to become a nursing assistant. She said she never wanted an abortion, but she couldn't have afforded her prenatal visits, let alone the delivery, on her own. "If Medicaid wouldn't have paid for it, it would have been thousands of dollars," she says. "And being a single mother, you really just can't — can't pay for that." A lot of women can't. For pregnant women in the United States, Medicaid is less a safety net than a building block of the maternity care system. Of the 4.3 million births in the United States each year, more than 2 million are covered by Medicaid — nearly half. The program covers not only delivery, but also prenatal and some postpartum visits, as well as infant care. For the Hannah Center in Indiana, at least 90 percent of clients receive Medicaid. Directors of several similar organizations interviewed by NPR indicated that most of their clients also do. An NPR review also found at least two dozen such centers advertising online that they offer Medicaid referrals or enrollment assistance. 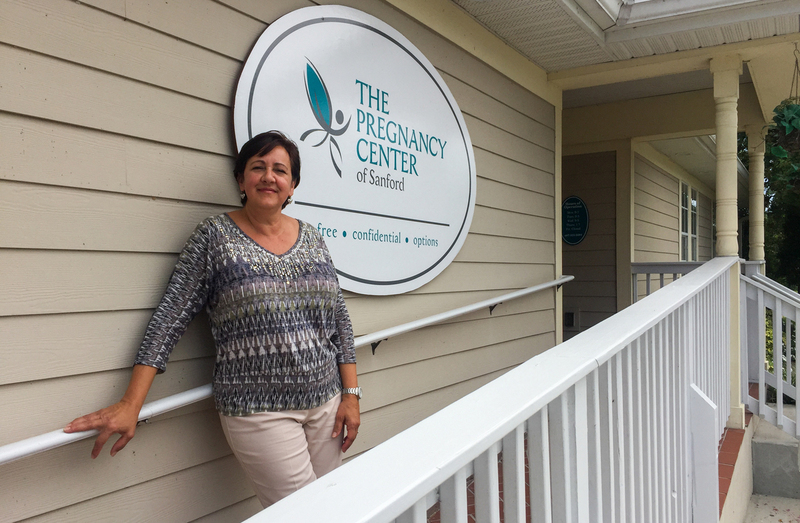 Andrea Krazeise runs the Pregnancy Center of Sanford near Orlando, Fla., which provides free pregnancy tests and paperwork to verify a positive result. "That's the primary service that every pregnancy center offers, is the proof of pregnancy," Krazeise says. Without Medicaid, Krazeise said many of her clients likely wouldn't see a doctor until the very end of the pregnancy. "She would go to the emergency room or she would have no care, and then when her water breaks and she's about to go into labor, then she'll be in the emergency room," she says. Andrea Krazeise, who runs a pregnancy resource center in Sanford, Fla., says that without Medicaid, many of her clients wouldn't see a doctor until the very end of the pregnancy. At ACCESS Pregnancy & Referral Centers in Metairie, La., Michelle Black works with clients like Tara Lang, 28, of Jefferson Parish, whose daughter was born in January. She turned to Medicaid after her fiance, who'd been providing her health insurance, was killed in a motorcycle crash by a drunk driver while she was pregnant. "My world turned upside down completely, like literally in five seconds," Lang says. Medicaid has been targeted for cuts under recent Republican proposals in Congress. Black worries that might in turn push states to slash reimbursements to physicians. Black says such cuts would hurt the maternity clinic her organization also runs, and make it harder for pregnant women to find doctors. "I mean it's a major concern," Black says. "We've actually seen fluctuations in the amount of money that we get reimbursed through the clinic, and I know the doctor offices are seeing that as well. So in some cases people who have accepted Medicaid in the past aren't, because the reimbursements have shrunk," she says. "So we've been watching a whole lot of things; we know that it's affecting our clients." There's a danger that patients will struggle to find care if reimbursement rates are cut, according to Matt Salo, executive director of the National Association of Medicaid Directors, which represents directors of state programs. "If you precipitously drop what we pay, then what you're gonna end up with is a scenario where the Medicaid insurance card is kind of like a hunting license," Salo says. "Yes, you have coverage — but good luck finding someone who's gonna be willing to take pennies on the dollar to treat you." Women's health groups like the American Congress of Obstetricians and Gynecologists note that uninsured women have higher rates of pregnancy complications, including preterm birth. CEO Hal Lawrence says those women also have a harder time planning future pregnancies because of reduced access to contraception. "And so they have a higher incidence of unintended pregnancy," he says. At her pregnancy center in Indiana, Tuley-Lampke said she has occasionally caught flak from conservative donors for helping women enroll in government services. "They'll say something like, you know, 'Shouldn't your job be to get people off of government services, and not on government services?' I think that's definitely the goal." But that can't always be the goal, she says, when you have a lower-income single mom who either doesn't have a job or, if she does have a job, it's minimum wage or less. But Tuley-Lampke she says she's seen several women decide to continue their pregnancies after learning that their medical care would be provided. After pregnant women get basic health care, she says, they can then focus on their education and career. "Sometimes simply explaining to them, we can help them through the process of obtaining Medicaid, is all it takes for them to realize, you know, 'I can do this; I can be a mom,' " Tuley-Lampke says. "And so it is very ironic to me that people who are pro-life would not also be pro-Medicaid." Tara Lang was pregnant with her daughter when her fiance was killed in a motorcycle crash. A pregnancy center in Metairie, La., helped her sign up for Medicaid coverage.